Our custom home and commercial water dispensers are true work of art on all levels. Each dispenser is hand blown, colored and styled. The dispensers are made from pure glass. The inner layer of glass has no coloring or anything added that may get exposed to the water. Layer 2 and 3 however, are infused with a melody of colors to create this truly revolutionary water dispenser. Dispensers can be made custom to your specifications. We give our blowers full creative freedom based on specs; size, color, & shape. 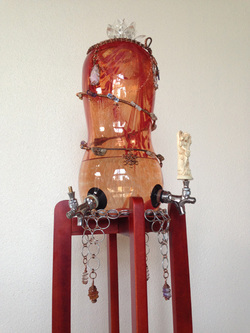 Comes with redwood stand, full wire stone wrapping, 1 stainless steel tap with Goddess handle.